An artist’s rendering illustrates what The Syndicate, a new event venue under construction in downtown Bellefontaine, will look like when it is finished later this year. 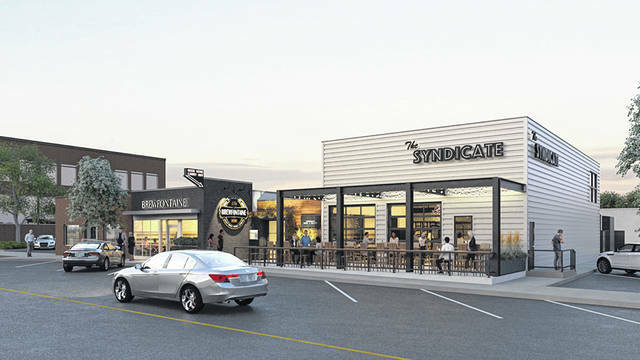 BELLEFONTAINE — The Founders of Brewfontaine, a popular restaurant and tap room in Bellefontaine, and the entrepreneurial team at Small Nation have announced the construction of The Syndicate, a new 5,000-square-foot wedding, event and outdoor entertainment venue in downtown Bellefontaine. Brewfontaine will expand its team and culinary capabilities for catering, weddings, corporate events and private parties with the addition of Brewfontaine Premier Events, a new catering and events arm of the business. The venue will allow for interior and exterior celebrations for hundreds of guests with the flexibility to install a tent for even larger events in a secluded area outside. The name, The Syndicate, pays homage to the historic site where the new building is being constructed, which was home to Jackson’s News Stand. The newsstand was operated by the Jackson family for more than 40 years. Located at 213 S. Main St., the building will feature a large, Main Street-facing patio, roll-up garage doors, a brick lined entertainment stage on the inside and an outdoor stage in the beer garden. The design of the project has been a collaboration of Mote & Associates of Greenville and Revival Design Studio of Celina. The inside of the building will feature 28-foot exposed ceilings, a New York-style steel-canopied newsstand, quartz countertop bar and polished concrete floors. The new event center will be constructed by the Link Construction Group, beginning in April. It is expected to be completed later this year.